Installing a new user interface on a smartphone can be a quick and easy way to change the look and feel of it, add more functionality or just make it feel like a different device. Windows Mobile is of course the smartphone OS that has attracted the widest variety of user interfaces over the years. Partly because the system has allowed it, and partly because Microsoft’s own UI has been in the dire need of some polishing. That will all change with Windows Phone 7 Series, though, since it will have an UI that cannot be customized by third parties. I think that’s a good thing in way, since it will make the Windows Phone experience more coherent and less schizophrenic. Android also has its fair share of different user interfaces, and Symbian is starting to get a few as well. 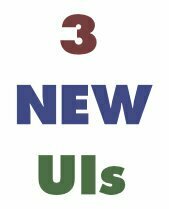 Here are three upcoming UIs for Android, Symbian and Windows Mobile that I think is worth keeping an eye on. First up is the Android UI TAT Home, by Swedish technology and design company The Astonishing Tribe. Judging from the demo video, I think TAT Home shows great promise, and I will definitely give it a try on my HTC Hero when it’s out of beta. You can actually apply for beta testing at their website, but it seems as if they currently have all the beta testers they need. I especially enjoy how widgets can be folded and unfolded, a feature they call TAT Cascades. Next up is the Windows Mobile UI TouchXperience by Julien Schapman, who also has developed the excellent tweaking tool Advanced Config. This particular UI has been in closed beta ever since I got my first WinMo device in the fall of 2008, and I’m starting to doubt that it ever will be released to the public. Though to his credit, it appears that he’s made some progress lately, and if all goes well we’ll hopefully see a public beta before too long. TouchXperience appears to be an unusually advanced user interface that goes deep, and it all look very flashy, but whether or not it actually will be useful remains to be seen. It was as recently as in early October last year that mobile software giant SPB released version 3.5 of their immensely popular user interface Mobile Shell. A couple of weeks ago, I received a press-release from SPB announcing version 5 of Mobile Shell, and that thanks to a “new portable SPB UI Engine”, it would bring along support for Symbian and Android devices as well. Even though that’s excellent news, I’m uncertain whether or not Mobile Shell 5 will be able to bring an equal amount of functionality to each platform, and I’m very curious to find out how it will perform on current Nokia Symbian^1 handsets. Some of the improvements include a new 3D engine with various sweet eye candy effects. How these will be handled by the N97 that lacks hardware accelerated graphics is somewhat of a question-mark, especially since the UI seems to lag a bit even on the hardware monster HD2. Version 5 also has better social networking integration, with message, contacts, photo and status sync with Facebook, Twitter and LinkedIn. No word yet on when all this actually will be released, though. In the meantime, here’s a video of Mobile Shell 5 running on Windows Mobile and Android.